They were a smart, intelligent lot I tell ya, them ancient Chinese philosophers and thinkers. They had such beautiful minds, coming up with philosophical proverbs that have stood not only the test of time but also (and perhaps more importantly) that of relevance. Amazingly, today - a millennium and a half later - their wise words are still quoted, dispensed as advice and even used as life or business philosophies by people all over the world. Without the benefit of air travel, the printed word or the internet from which to gain exposure to the outside world, these wise men drew their inspiration from everyday things as well as events; people, nature, flora, fauna, fire, funerals, festivals, fights, friends, foes.... pretty much everything really. However, the real beauty and significance of these old masters' philosophies lie in the fact that they are relevant not only to the Chinese, but to everyone regardless of colour or creed. This bears testimony to their profound understanding of the ways of men, their habits and their traditions. I'm going to share with you now a few of these ancient proverbs; no doubt you'll find some of them most interesting.... or maybe even relevant to you. 1. Try to save a dead horse as if it were still alive. Dare to attempt the impossible for it may truly be possible. This proverb teaches people to keep trying and to not give up; and to continue trying even when you think absolute impossibility has been achieved. 2. 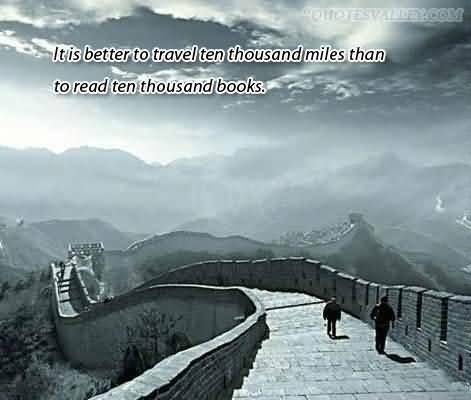 It is better to travel ten thousand miles than to read ten thousand books. Practical experience is far more useful than theory. One might argue that by reading, he or she is able to travel ten million miles... but reading isn't doing. Doing is experience, and life is all about experience and growth. 3. A family with an old person in it possesses a jewel. Those in their golden years have a better understanding of life. They are considered the repositories of tradition and wisdom as well as conservators of social mores. They are people of especial worth and are held in high regard amongst the Chinese who generally accord the elderly with due prestige and reverence. These are people who have reached that gentle decorum and dignity which testify to their ability to ride at anchor however stormy the weather. A family with an old person in it is therefore considered fortunate to have such an anchor and rock - or a "jewel" - in the household. 4. A friend made is a road paved, an enemy a wall built. A motivational proverb that encourages people to make friends instead of enemies. Friends are there to share your joys and sorrows; to help you in times of need - a road paved, signifying hope. Enemies, however, are invariably a liability; or the figurative brick wall. 5. Think three times before you move. One should always act only after due consideration. An act committed or a decision made in haste may result in a miscalculation, which in turn may lead to undesirable - or even dire - results. So remember; think thrice - not twice. 6. A fox borrows the tiger's might. This is how the story goes. A fox caught by a tiger had an idea for survival. He led the tiger to a place where many other animals congregated. On seeing the approaching tiger, the animals scampered for their lives. The fox, however, managed to convince the tiger that it was he that the animals feared and not the tiger. 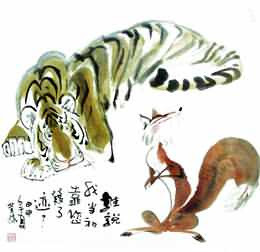 As a result, the tiger gave due respect to the fox and did not harm him. The proverb basically means relying on someone else's influence to intimidate, bully or manipulate others. 7. Add legs to the snake one has just painted. This proverb essentially refers to the notion of doing something that is totally unnecessary (snakes don't need legs) and, in the process, spoil what one has already done well in the first place (the painting). 8. Burn a forest to farm and drain a pond to fish. Isn't this exactly what we're doing to our planet now against the backdrop of this old proverbial warning? This proverb speaks of someone who is so desperate to achieve an end that he'll do anything to attain success regardless of the consequences or any peripheral damage his actions may cause. 9. When the winds of change blow, some build walls while others build windmills. When circumstances surrounding your life change, it is wiser to adapt to the changes than to remain static or stubbornly unresponsive - something you're likely to regret later. This proverb also encourages people to seize the opportunity when one comes a-knocking. And lastly, here's one which the missus keeps drilling into my head because I'm such a wreck at delegating tasks. 10. Three monks have no water to drink. One monk will shoulder two pails of water, two monks will share the load of one; but add a third and no one will want to fetch water. It essentially means that in a team, it is not unusual for members to mutually rely on the others to do the work; and in the end, nothing gets done. This proverb teaches businesses how to allocate resources and employees' duties. Every employee must be told his or her specific tasks which they have to perform in order to achieve a common goal - in this case, water to drink. I've really only skimmed the surface here with these ten proverbs. Fact is, there are hundreds - possibly more - in existence. Although they were written by men with what I'd imagine to be fairly limited practical knowledge of the world outside of Middle Kingdom, you'll find that they nonetheless pretty much apply squarely to every man, woman and child. Which makes me think how truly interesting it is for human behaviour and thinking to be so timeless, consistent and predictable across all cultures. Don't you agree? I hope you enjoyed reading this post as much as I did writing it. Have a very good day, everyone... and remember; in all that you do, endeavour always to "add a flower to a bouquet". Which of the above proverbs do you find most interesting? Are you able to relate to any? If you have any Chinese proverbs to share, please post them in the "Post a Comment" box below; kindly include explanations, if possible. Nice and very educative post. Chinese proverbs or also known as Chengyu is an important part of learning Chinese language. Knowing Chinese proverbs and its history behind deepens the Chinese language knowledge more. You're so right there, LCO. Thank you for sharing your thoughts here. Please share my blog with your friends and associates. very nice thank you for the post.